The view from the top of Masada overlooking the Dead Sea. There’s simply nothing like visiting an ancient mountaintop fortress that overlooks the Dead Sea. It doesn’t feel real. 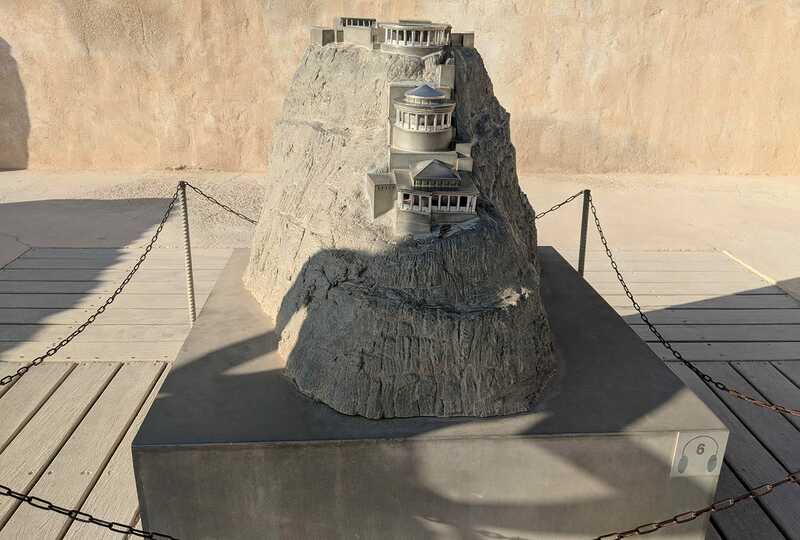 But because of its isolation and the arid desert climate, the fortress once occupied by King Herod is a remarkably well-preserved relic of humanity’s ancient past, one you can climb to on the same paths used by visiting dignitaries and invading Roman troops. Because Masada is located in a relatively remote region of mountain desert next to the Dead Sea, we stayed in Jerusalem. A view of the historic Western Wall and Temple Mount/Dome of the Rock, within Jerusalem’s Old City. Israel isn’t very large, which makes it relatively easy to drive between major cities and remote destinations like Masada. You can stay relatively close to the site, but we chose to stay in Jerusalem. It took an hour and a half to reach the base of Masada by car from central Jerusalem, driving through total darkness in the wee hours of the morning. We had a goal: reach the base of Masada by 4:30 a.m., allowing an hour to hike up the mountain before sunrise at 5:45. Sunrise at Masada is part of the experience. This is what it looked like at the entrance booth around 4:30 a.m. It was a total relief to see after the ride through pitch black desert morning. If I’m being totally honest, the drive to Masada at such an early hour was spooky as hell. My wife and I speak next to no Hebrew or Arabic, and we drove a rented Toyota Corolla through total darkness to a remote part of the desert in a foreign country. And not just any foreign country, but Israel. In the two weeks we were in the country, a Syrian drone was shot down over the Sea of Galilee in the north and Hamas floated incendiary kites from the Gaza Strip in the south, which ignited a response from the Israeli military. The mixture of complete darkness, next to zero other cars being on the road at such an early hour, and the generally fraught feeling of being in a contentious part of the world really got to both of us. We were relieved to reach Masada relatively quickly, after an Israeli military checkpoint guard waived us through. Though sunrise was still an hour away, light started filling the valley below Masada by 4:30 a.m.
A handful of palm trees indicate where visitors to Masada can park. As they shrink into the distance on the climb up the mountain, it becomes more and more apparent how grand this ancient fortress was. There are two options for reaching Masada on foot: the “Snake Path” and the “Roman Ramp.” We took the former. Since my wife and I are adults, she posed as a snake next to the sign. Masada dates to King Herod, a massively influential ruler of ancient Judea, a mountainous region of modern day Israel. The fortress doubled as a palace for Herod during his lifetime, around 100 BCE. Flavius was big on drama, clearly, but he’s not embellishing that much. For some of the path, there’s just incline; for other parts there are stairs. Some of that has a railing – a luxury that Herod’s visitors wouldn’t have enjoyed 2,000 years ago – but much does not. Even before the sun came out, it was brutally hot and humid. This is not a climb for the faint of heart, though it is certainly doable with persistence and plenty of water. Estimates put the climb at anywhere from 45 to 90 minutes; it took us about an hour at a steady clip, racing to beat the sunrise. On the way up: resplendent views of the Dead Sea and the valley around Masada. The guard rails appear about a third of the way up the Snake Path. While panting with exhaustion on the way up to Masada, I would occasionally pause to take in the absolutely ridiculous view that was rapidly appearing behind me – the same view that Roman warriors and ancient Jewish kings marveled at over 2,000 years ago. It’s easy to imagine you’re on top of the world from here. By the time we reached the staging area just below the mountain plateau, I was crazy exhausted. My wife, who runs 10K races for fun and smiles in the face of danger, couldn’t stop cheesing. The hike from the base of Masada to the top of the Snake Path is just shy of 1,000 feet. Despite the disparity between our reactions in the photo above, we were both pretty knocked out by the rapid ascent up to Masada. Bring a refillable water bottle to the hike, filled with water. There are places to refill at the top of the climb, but nothing on the way up. It is crucial that you stay hydrated, as temperatures can reach as high as 110 Fahrenheit when the sun comes out. Sunscreen is similarly crucial, and a few snacks wouldn’t hurt either. Exploring Masada takes a few hours, and there’s no snack bar. Some folks we saw brought full on picnic gear. Not a bad idea! Don’t let the light fool you — sunrise at Masada is distinct and obvious, separate from first light. You can just barely see the sun cresting over the mountains in the distance. After you reach the staging area below Masada, it’s a short stairway up to the fortress itself. From there you’ll get the best possible views of the sunrise – since the Snake Path climbs up the eastern side of the mountain, you’re already facing the right direction. As the sun slowly rose in the east, the valley below and the Dead Sea lit up — the first glimpse at the vast, gorgeous landscape we drove through in total darkness. Watching the sun peek up over the mountains, then rapidly fill the sky over the next 10 minutes, was beyond worth the hike alone. It was worth waking up at 3 in the morning and driving through total darkness in a foreign land, and then rushing up a thousand-foot climb. In a two-week trip full of life-changing memories, climbing to Masada just in time for sunrise topped them all. And that’s before we start talking about the incredible fortress itself: Masada. Masada is situated on a mountaintop plateau. It’s a site of major importance to the history of Judaism, having been constructed by a Jewish king. It was just after 6 a.m. and a group of rabbis gathered under a tent on top of Masada. They were singing passages from the Tanakh – the Jewish bible – in Hebrew. There were religious groups gathered at Masada, and loads of explorers like my partner and myself, already atop the ruins by 6 a.m. It was never crowded – the hike naturally limits the number of people – but things pick up significantly when the cable cars start running at 8 a.m. Between the incredible view of the sunrise and the relative quiet at Masada so early, I would strongly suggest following the Snake Path an hour before sunrise. This is a real, unedited photo. 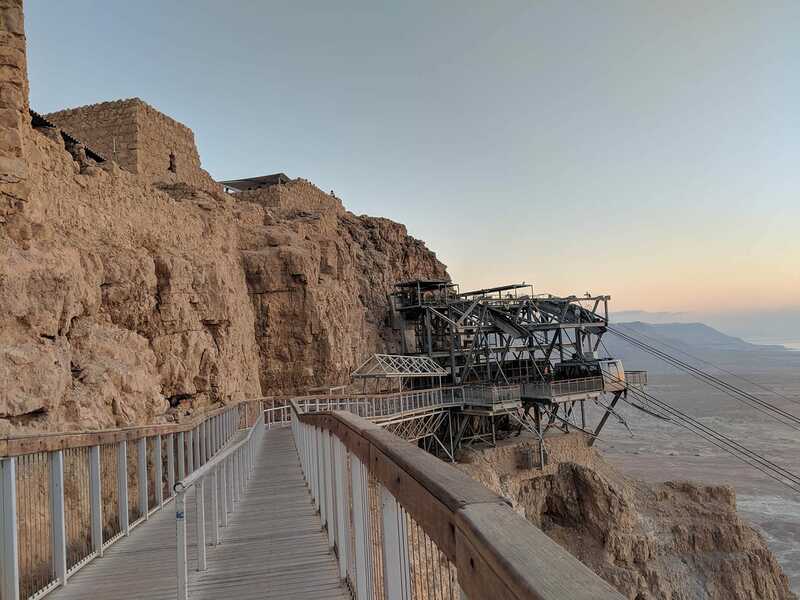 More than just pretty views, there’s a ton of stuff to explore at Masada — much of King Herod’s fortress is still intact. Entire sections of King Herod’s fortress remain in remarkably good condition for two millennia of wear. There are storerooms to explore, an incredible viewpoint of the world below Masada, bathhouses, and much more. Masada feels a bit like Mars. This path leads to adventure. Admittedly, I’ve never been to Mars, but I imagine it feels a lot like being at Masada. Nearly everything is one color, contrasted against the stunning blue sky overhead and a sun that feels nuclear at 7 a.m. in mid-July. In the distance, in any direction, there are ruins begging to be explored. Some of those ruins housed the Jewish rebels who fled from the Roman Empire in the first century CE. Roman soldiers overtook Masada in 73 CE; the rebels inside are said to have committed suicide before the Romans could reach them. Reports vary on how many people were inside Masada at the time. Roman historian Josephus Flavius put the number at just under 1,000 people committing suicide; archaeological remains put the number at 28. The so-called “Roman Ramp” on the western side of Masada was constructed at the time as a means of reaching Masada and overtaking it. The ramp worked and remains effective to this day – it’s the secondary path to the top. As we explored the ruins on the edges of Masada, it was clear why Herod chose the spot for his fortress — 360-degree views of the world around him. It wasn’t until decades after Herod’s death that Masada was overtaken. At that point, the occupying force wasn’t equipped to fend off a well-supplied Roman advance. Entire portions of tile mosaics and columns from Herod’s time are still in place. It’s easy to imagine how gorgeous the palace must have been in its heyday. Entire rooms are still in shockingly great shape — partially the result of careful restoration, partially the result of being completely isolated in an arid climate. Here’s a look at some of that careful restoration in process; this park worker was already on the job before 8 a.m.
Masada is a UNESCO World Heritage site, meaning it’s legally protected by international treaties and recognized by the UN as a site of historic importance. As such, park workers are stationed all over Masada; they offer information and make sure no one’s doing anything dumb. And some are working on restoring the park, as seen above. There’s an absurd amount to explore at Masada, and it’s easy to get caught up in the distant past. A big part of getting to Masada at sunrise is getting to explore Masada before it gets too hot. By 9 a.m., temperatures were hitting 100. It’s tremendously hard not to get too caught up, though; there are gorgeous ancient ruins to be gawked at around every turn. This outlook approximates an outlook that King Herod had during his rule (37 to 4 BC). The modern wood and metal incarnation of the viewpoint isn’t quite as impressive as the original, re-created in a sculpture nearby, but it offers the same incredible views. By this point, around 10 a.m., the heat was extreme – so extreme, in fact, that park authorities outright close the Snake Path to anyone going up. The only way to get to Masada at that point is to take the cable car. After waking up crazy early, hiking to Masada, and exploring ruins for several hours, the hike down was intense. We had to take breaks for water, and to re-apply sunscreen. Both of us wore hats. Re-fill your water before exiting Masada down the Snake Patch. Prepare yourself for a surprisingly tough downhill hike in full desert sun with lots of sunscreen, and try to cover as much of your skin as possible with light clothing. An American woman died from dehydration while descending the Snake Path in 2015; please do not underestimate the seriousness of this warning. As we descended, cable cars passed overhead. It is, admittedly, much easier to take a cable car to Masada. But then you don’t get to tell people you climbed to the top of an ancient fortress, along an ancient trail, just to watch the sun rise. I didn’t expect to be so personally affected by the grand history on display at Masada. She’s dead on. Climbing the same trail that hundreds of generations of humans before me have, looking out with wonder at the world below, just like so many before me have. And there’s the other side, of course. The less beautiful side of history. Roman emperors and Jewish kings in the Fertile Crescent, frozen in time atop a gorgeous plateau, forever locked in battle. Nothing is left of either – just the ruins of their buildings. The conflict feels sadly familiar in its context. Israel Defense Forces officers with semiautomatic weapons guarded the checkpoint we passed on the way to Masada earlier that morning. They’re a shockingly common sight all over Israel – a symptom of regional conflict (to massively oversimplify it). When you visit Masada, it’s impossible not to see the vast scope of human history. It’s there in front of you, amazingly well preserved, highlighting how infinitely small our modern conflicts are.